Delegation of Swedish Navy visited St. Petersburg to resume relations between our navies suspended after Aug 2008. In his interview to RusNavy.com, Chief of the Royal Swedish Navy Anders Grenstad told about areas of potential cooperation between Russian and Swedish mariners. - Mr. Grenstad, could you tell about purpose of your visit to St. Petersburg? - There has been a pause in relations between our navies caused by known events of August 2008 in Transcaucasia. That's why this visit is primarily a step toward renewal of naval cooperation between our countries. We want to return to those common points we had in 90's and early 2000's. Our countries have similar views on security in the Baltic region. I've already had two very fruitful meetings with Russian Navy Commander-in-Chief and Baltic Fleet Commander. Both were conducted in quite warm and positive atmosphere. Our countries strive for close bilateral relations, including those at sea. Now our headquarters will work out options for prospect cooperation. Sure, all these issues have to be discussed by politicians as well, since the military is nothing more than a tool of policy. - Sir, what is your personal perception of "Baltic regional security"? Visiting New Zealand, you said in the interview that you saw no threats in the Baltic. - You did well while preparing for our talk! Indeed, I have a strong recollection of these words said in that interview. Of course, I see no threat from Russia. Talking about security in the Baltic, I primarily mean security of civil shipping and anticriminal warfare. Of course, such countermeasures are not the task for the military, but we can share information with civil authorities and thereby help our coast guard. However, apart from activities in the Baltic, Swedish Navy maintains security in other regions worldwide, for instance, off the Somali coast. So, when we speak of Sweden and Russia, I see our cooperation not only in the Baltic Sea but all across the world. - Originally, the Royal Swedish Navy was established for littoral operations in the Baltic Sea. How does it feel in ocean? - My Danish counterpart says we have littoral navies but capable to operate anywhere. Among the tasks assigned to Swedish Navy by our government, the top-priority ones are training of personnel and development of naval hardware. So, if we can use our ships in other regions of the World Ocean, we would do this for sure. Because despite the strongly pronounced littoral nature of our navy, all international operations we attend will be continued in the same way and quantity they exist for the moment. - Almost 30 years ago a Soviet sub took the ground at Swedish coast. What is your current feeling on this incident and what did you think about it at that time, being a "newborn" lieutenant? - By the time of my commission, that by no means was a first incident. There had been a bunch of confrontations near Swedish coast, but that particular case you're talking about was really something unusual even for the cold war flaring between two coalitions. Nevertheless, we had a chance to master antisubmarine warfare and acquired good experience of headquarters cooperation. But we would unlikely ever know the real reason why that submarine happened to strike the bottom there. - Let us go deeper into the history and recall the World War II. Soviet submarine S-8 wrecked in 1941 in Swedish territorial waters. She was found at the turn of centuries; in 2000 Swedish and Russian navies arranged a memorial action at the accident site and laid wreaths from Russian destroyer Nastoichivy. Do you have any plans to arrange any similar ceremonies jointly with Russian Navy? - I think that could be a really good motive to renew our relations and cooperate more closely. I guess we should set working groups for further studying of this issue. - Sir, how does your family behave to your frequent and long leaves? - For that matter, I'm very lucky man. My wife often accompanies me in business trips. By the way, she is also in St. Petersburg now. Anja had been working in Russia for a long time, about 10 years, and is very happy to visit this country again. My children are 25 and 28 years old, so I guess they don't grieve much when their parents are absent. Rather, they are glad that mom and dad are not with them all the time. The reason why I have been traveling for recent six years is because Sweden started to attend overseas naval operations. In addition, I must promote Swedish arms and military equipment abroad. Particularly, that was why I visited New Zealand, Singapore, Australia, the U.S. and other countries. - Thank you, sir. We appreciate you made time for answering our questions. Born on July 22, 1958 in Stockholm. 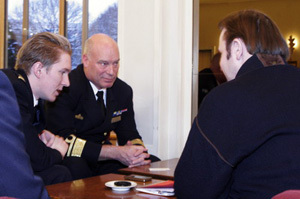 2005, May: Chief of Staff of the Swedish Navy. Married to Anja; two children – daughter Valerie born in 1983 and son Vincent born in 1985. Anders Grenstad is a fellow of the Royal Society of Naval Sciences. Hobbies: golf, running, water sports.